Thank you to the Alliance for Nonprofit Management for hosting a webinar with Christian Seelos and Johanna Mair to discuss their book Innovation and Scaling for Impact. 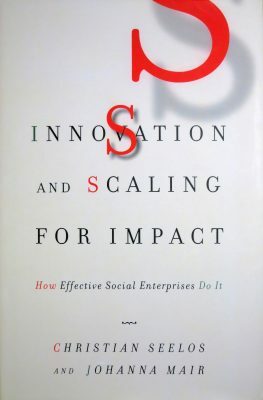 Innovation and Scaling for Impact won the Terry McAdam Book Award in the fall of 2018. The pair have been studying innovation for years. When asked by a large international foundation to help them assess the capacity of NGOs for continuous innovation, they had to ask why this is even a desired goal. We all find that funders and business leaders are pushing nonprofits to “innovate” more. Not so fast, say Seelos and Mair. If your NGO expects success immediately from innovation you are likely to be frustrated. But if learning is a key objective for your attempts at innovation, you will not fail. Innovation and scaling are not the same. It is not innovation that creates impact, but the scaling of the innovation. Understand how innovation is part of a long term strategy. Push back against funders that are too focused on quick fixes and too much innovation. Help funders understand organizational realities. Be a good scaler first.. stay close to the problem, fine tune it, prototype changes, assess them, keep looking for reasons why it might not work, keep your eyes open to unintended consequences, positive and negative. Problem and context: Do you really understand your problem? Do you really understand the circumstances surrounding your problem? Solution: What resources and requirement are necessary to support any solution. Adoption: Will others take up the innovation? Consequence: What are the side effects? Are there unintended negative or positive consequences of the innovation? Identity: Perhaps the innovation is successful, but it distracts your organization from its core mission, from addressing the problem you were attempting to solve. Insufficient exploitation, e.g. not scaling and learning from the scaling. While the examples are from South Asia, the book is worth a read for any nonprofit.